Every month we launch a new giveaway. Why? Our giveaways aim to increase breast cancer awareness year-round, drive participation by asking our fans to share their experiences through blog post comments, tweeting or sharing our work. Participating in our Breast Cancer Awareness Giveaway is Simple! 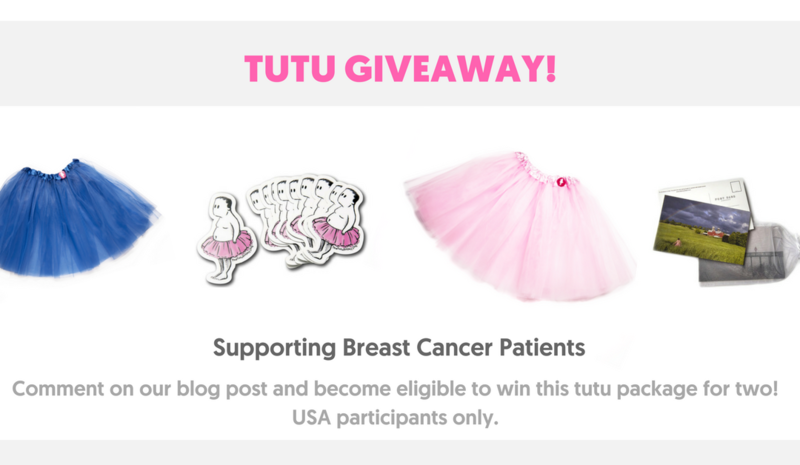 Comment on this month’s featured post How to Talk to Kids about a Breast Cancer Diagnosis and you’ll be eligible to win a tutu package! Package includes a pink tutu, a blue tutu, a set of stickers and postcards. This blog is so important. My mother’s best friend received a breast cancer diagnosis when her children (that she had adopted and was raising as a single mother) were still small. This is not an easy conversation to have, but children have an innate sense when something isn’t right, and we owe it to them to be honest in a way that they can comprehend, while still allowing them to process news as children. This is such a great project!! Thanks for all you do. Great to see you this morning, Bob! I am so happy to hear your wife is doing ok and it’s so great to see that the Tutu Project is still going strong! Thank you for doing this!